BLUES IN ORBIT: A special tribute concert featuring the music of Duke Ellington marked the 50th year anniversary of Apollo 11.
Who would have immediately thought that there was a connection between explorations in space and the music of Washington, D. C. native Edward “Duke” Kennedy Ellington? It’s not one that most people readily make. But on Tuesday, April 9, that connection took front and center in a special commemorative program mounted by NEWorks Productions at Harmony Hall Arts Center in John Addison Auditorium. Local News 4 anchor Pat Lawson Muse served as emcee for the event. Ellington was inspired by the historic landing of Apollo 11 and commissioned by ABC-TV to compose the song “Moon Maiden.” Significantly, this also marked his debut as a singer. Singer George Victor Johnson who has shared the stage with many legendary jazz greats was on hand to render a stirring rendition of the classic. Prominently featured on the special program was the United States Army Blues. 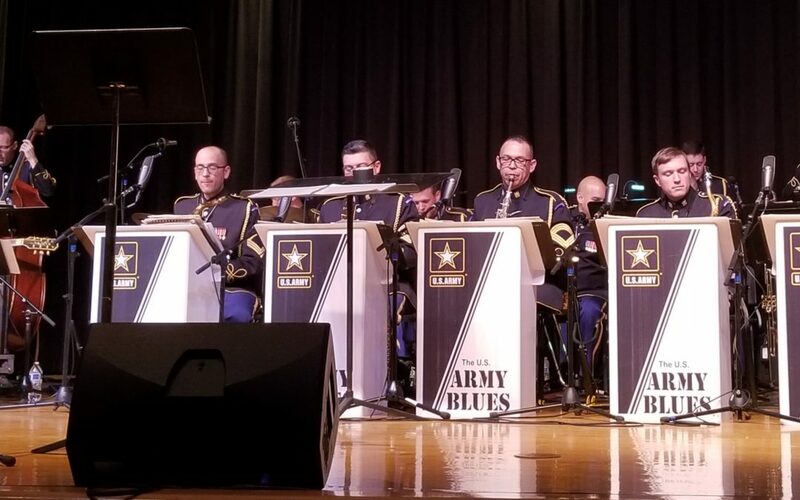 Comprised of all active duty officers, the instrumental ensemble performed stirring renditions of Ellington throughout the evening. Whether is was the full compliment of instruments or the outstanding individual solos, the group captured the musical greatness of the jazz legend. A key component of this project was the manner in which it connected science and music together in one setting. 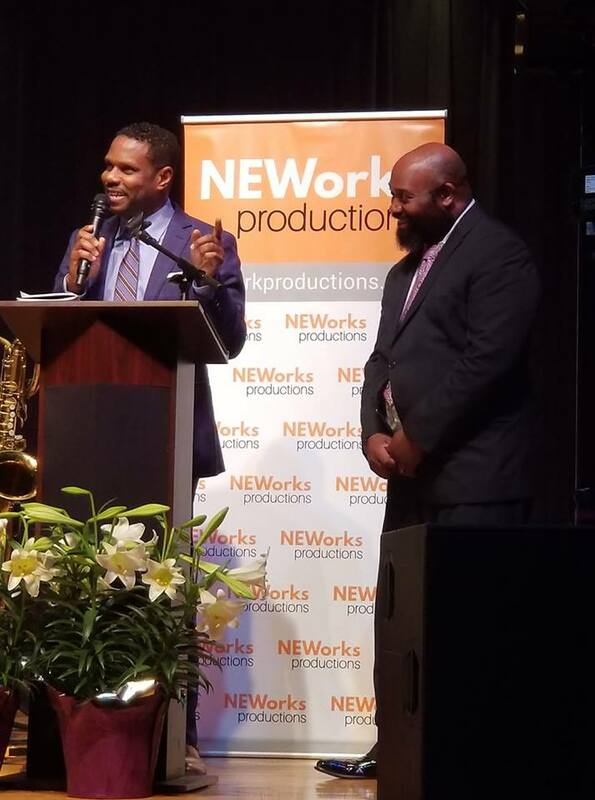 NEWorks founder Nolan Williams, Jr. shared his enthusiasm about the program and how it has been used to get young students excited about science through the Blast Off! Hip-Hop/STEAM Performance Series featuring Lemond ‘IMAG’ Brown which recently kicked off at Northwestern High School. Continuing that theme was the presence of two young instrumentalists: Brandon Seaforth (trombone) and Langston Hughes, II (alto saxophone). 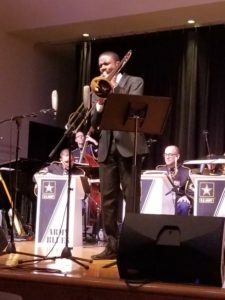 Seaforth, a senior at Suitland High School and Hughes a senior at Charles Herbert Flowers High School were both featured as soloists with United States Army Blues. Both young musicians performed with such skill and are certainly rising stars to watch. Works of poetry performed by Laylah Jackson, also a student at Suitland High School and prominent local poet Patrick Washington paid tribute to the special evening through excellent prose. Suitland High School senior Brandon Seaforth joins the United States Army Blues for a selection on his trombone. At the center of the program was the world premiere of an original work by DC musician, pianist and composer Allyn Johnson entitled “One Giant Leap.” Commissioned by Williams and NEWorks to celebrate the Apollo 11 landing and the hidden figures of the space world such as Katherine Johnson, the original music evoked a sense of an ethereal presence throughout. From the mystical tone set by the drums or the resounding cymbals, the opening movement conveyed a perception of the unknown. The descending passages in the piano line seemed to bring heaven to earth, where as the soaring trumpet represented a perpetual moving upward to the beyond. Movement II “What is Woman, What is Man?” indirectly gave homage to the presence of higher power and its role in creation. Giving a gentle nod to Psalm 8, the text came to life with the stirring voices of noted area singers Nova Payton, Robert Person and Theresa Watson. Ending the triptych was “Black Computers” a celebration of the legacy of black women in the world of space. 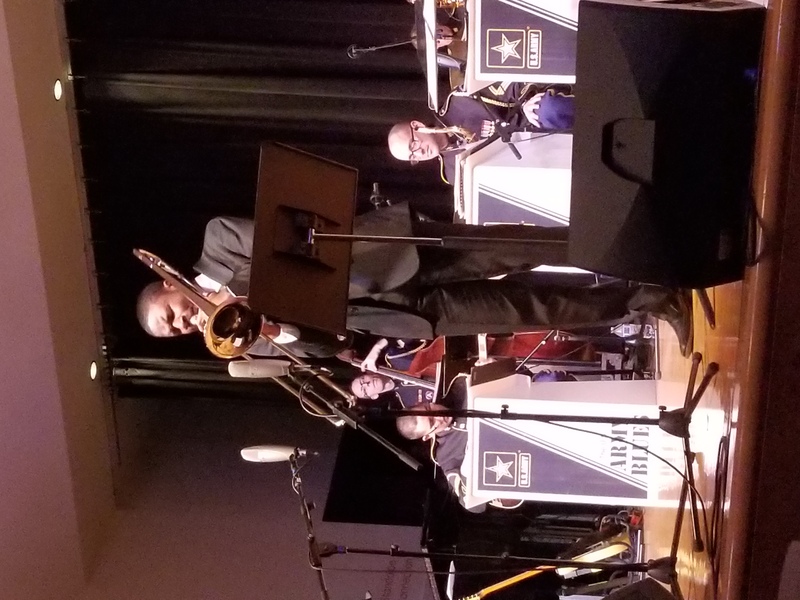 After a full evening of celebrating jazz, blues and outer space a grand musical finale featuring United States Army Blues and FAME (Foundation for the Advancement of Music and Education) artists Brandon Seaforth and Langston Hughes, II brought the program to its conclusion.